The lovely (and multitalented) Liz of Hourglass Dollhouse. She scored this vintage netted hat for $5. I've been planning a post like this for a long time. I'm a wreck when it comes to vintage shopping. Sure, I've picked out a few items of jewelry, but for the most part, I'm too easily overwhelmed and too impatient to score anything truly amazing. So, I'm very excited to have vintage maven Liz here to share her tips! Who is Liz? Some of you may know her as The Loudmouth's little sister, but with her new blog and Etsy vintage shop, the Hourglass Dollhouse, Liz is claiming her own little piece of the interwebs. Unlike many vintage shops, Hourglass Dollhouse carries hard-to-find plus-size items and stocks sizes 0 through 20. In fact, the first sentence on her Etsy site reads, "Body image is not an issue here." I like this chick already. Shopping for vintage clothes may seem like a daunting task, with all the rummaging through endless racks of clothes at thrift stores or paying an incredible amount of money for just one shirt at a swanky boutique, but it doesn't have to be! It can be so interesting, exciting and altogether rewarding. I am a thrifting ADDICT, and I would love to share with you my tips and tricks to turning vintage shopping into a successful pleasantry. First of all, it's all about location. The best places to find super cheap and super unique vintage pieces are at large thrift stores, flea markets and garage sales. At these locations, it does take a little more work to rummage through the immense piles and racks of clothes, but in the end, you'll find better pieces. Why? Because a lot of the really good stuff comes from the elderly and their adult children who don't generally take their things to a boutique to sell or waste time on Ebay (because these are newer ideas). They just donate them or have a garage sales. The best part about flea markets and garage sales is that you can usually barter with the sellers to get the pieces for even cheaper! I have had the most success at Salvation Army and Value World. Granted, I am from Michigan, which is thrift store heaven, so if you don't have these stores where you live, I'm sure you can find an equivalent. There's also Goodwill and St. Vincent De Paul in Michigan, along with other random donation-based thrift stores. The best part about Salvation Army is that they offer 5 for $5 on Fridays. They also have other random events during which all clothing is 50% off. For example, in the downtown Detroit Fort St Salvation Army, every Monday from 4-7 pm is Ladies Night, which means that all ladies clothing is 50% off. Hell yes! There are also personal vintage shoppers like myself, which is a great alternative for people who get anxiety in packed thrift stores. Boutiques are usually more expensive because they have to pay rent and utilities for the shop, but online stores and people who sell at fairs have good prices for pieces that you'd otherwise have to search hours for. Next, you need to learn how to spot vintage tags, fabrics and designs. I find that looking at the tag is one of the best ways to catch an authentic vintage piece, since retro fashion is being reproduced by modern stores (like Urban Outfitters). The first step is to find the placement of the tag. Modern tags are not placed behind the neck as much as they used to be due to long-term complaints about comfort issues. 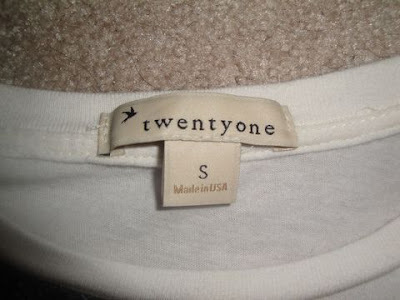 Many tags (mostly for higher-end clothes) are now stitched into the side seam towards the waist or hip, so if you catch a piece with a tag behind the neck, it is not as likely to be a newer piece. Next, look at the font and coloring of the tags. Check out this Silkage New York tag, which I am guessing is from the late 1970s or early 1980s. Now look at this recent Forever 21 tag. You can really see a difference in the design. Older tag designs are usually bolder and larger than modern tags. Here's another example of a vintage tag. This tag is clearly 1980s or early 1990s. So after you decide that the tag seems to be vintage, you must look at the fabric, design and shape. These aspects generally change from decade to decade and may recycle popularity. For example, 198's fashion is a sort of spin-off of 1940s fashion. 1960s fashion is being recycled now with all the crochet pieces, ponchos, faux fur and the whole Mary Jane/knee high sock combo. Basically, you just need to educate yourself on the fashion of each decade. Everyone knows that the 1980's were famous for fishnets, lace, bold colors and high waistlines, but there were so many other popular aspects of the era. It seems like the most radical and awkward fashion points of the 1980s are remembered, which were really just the mid to late 1980s. There are many transitional periods of fashion, like late 1970s to early 1980s dresses. They were very similar in shape, color scheme, fabric, etc. I think what happened is that Halloween costume companies decided to take the most obvious part of each decade and amplified it into a caricature. People always forget that mod fashion and hippy fashion came about in the same decade! And about fabric: Fashion before the 1980's LOVED polyester. 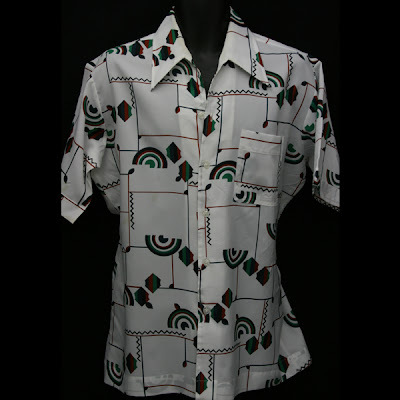 You can find countless 100% polyester shirts from the 1970s at any Salvation Army in Michigan. Here is an example of a 100% polyester vintage piece from the 1970's. Not only is the design a dead giveaway, but the fabric is, too. I would like to see the tag on this one! One more important aspect about shopping for vintage is sizing. You must remember that modern pieces are really two to four inches larger everywhere than vintage pieces. So, when people say that Marilyn Monroe was a size 14, she would really only be a size 10 if she were here today! This is why shopping for vintage clothes is so hard for a lot of women, especially plus-size women like me. People in general are bigger now than they used to be, so vintage shoes, hats, skirts, pants and the rest run small. I wear a size 12 in modern sizes, but when it comes to vintage, I may have to wear a 16, which is very hard to find. Luckily, I'm an addict, so I search and scour through everything to find pieces that fit me! I am a huge fan of the late 70s/early 80s dresses because they usually have elastic waistlines and stretch much better than 1960s dresses. That way, I can manage to fit into the smaller sizes if I can't find larger ones. Here's an example of vintage sizes: The mannequin is a modern size 4, and the romper is a vintage size 4. I could barely fasten the buttons, and I was afraid to rip the adorable piece! You can see the buttons pulling. And note that the back has elastic, which was stretched to the max. The difficulty in finding larger sizes for myself and others is why I have made it my mission to always carry larger sizes in my Etsy store and, hopefully, in my future boutique! It is hard being a modern plus-sized girl in a desired vintage fashion world. I would love for any lady of any size to dress for her shape, look gorgeous and fulfill her desire to wear vintage threads! So remember, try on everything before you buy it. If you're weary about trying on a donated item of clothing, at least give it the bust/hip stretch test, which I have to do since those are my two largest areas. But I guess if you are like me and you're reselling vintage, just buy it anyway, and if it doesn't fit, sell it!